If you love the look of antique light fixtures, you’ll now be able to enjoy significant energy savings as well. Most LED light bulbs now can fit into standard incandescent sockets. 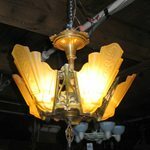 With that innovation, homeowners have some new energy saving options when used with salvaged and antique light fixtures. Most people have switched over to compact fluorescent bulbs (CFLs) for energy savings and longer life. But with 25,000 to 32,000 hours of life, LED bulbs are the marathon runners of lighting. One aspect of compact fluorescents that was apparent early on was the difference in the bandwidth of light. Some early CFLs emitted a cold, blue light that was not a comfortable option for interior lighting. Manufacturers have updated their bulb designs so that many options are now available. LEDs have gone through a similar transformation, and many standard socket LED bulbs feature three-way capability, dimmers, and light quality choice. Some bulbs feature fins, striped areas and other exterior molded plastic pieces, so you’ll want to take a look at several styles to best fit the fixture you’re recycling. A good place to compare different LED bulbs is Top Ten Reviews, which compares, pricing, life, lumens, wattages and other characteristics of these appliances. In selecting an antique or salvage fixture, you’ll need to check to see if the wiring is serviceable. If it looks frayed or broken, you’ll need to re-wire the fixture, which is a relatively easy do-it-yourself project. Because LED bulbs emit significantly more heat that CFLs or traditional incandescent lights, you’ll want to select fixtures that are not enclosed as they can overheat quickly. There are a number of great online salvage sites for fixtures. City Salvage has a wide selection of fixtures and many different architectural styles form Victorian, to art deco (above) and classic schoolroom lights (right).